careers, improv comedy, learning to fail, risk-taking, success and failure, wage gap, women, women and risk, yes and! Research today illustrates that on average women do not take the same career risks that men do. Why? The reasons are complex but they all point back to a very important subject – how women perceive, manage, and act on risk. Despite gender differences, however, the fact is that anyone can increase the confidence required for smart risk-taking. My experience in corporate America corroborates these findings. As a marketing expert, I’ve seen women take far fewer risks in the workplace. I’ve also seen that same fear of failure mirrored in my almost 20 years doing comedy and improvisation. In that time, I’ve seen women come and go – quitting before they reached the prize of confidence, acceptance and the ability to take risks and handle failure. The ability to take risks and to see failure as learning are key “attitudinal” elements needed for career growth, innovation, and yes, for comedic success. Today, I perform regularly with a group where the percent of women ranges anywhere from 10 to 25%. At one time, in a group of 14 players, I was the only woman. 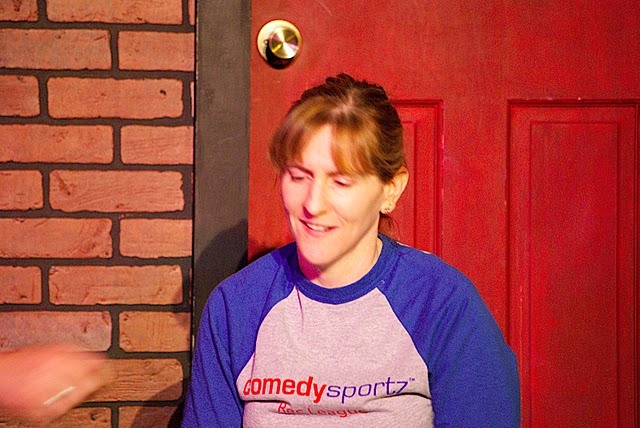 My stand-up days were more polarized: I’d often be 1 of 2 women on open-mic nights out of a lineup up of over 15 comics. The good news is I think the gender ratio is changing – slowly – at least in improv. 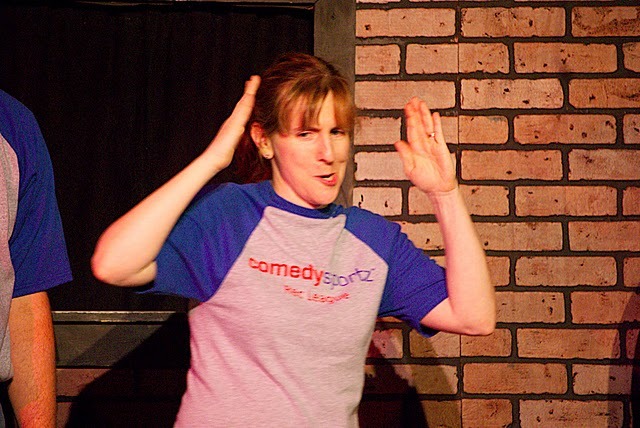 In my experience, there are more women in improvisation than in stand-up comedy. While I am sure there are many social and cultural (as well as family) reasons that contribute to this situation (and because many women aren’t nurtured to think they are funny), I also know the rewards that come from improvisation and they go well beyond just being funny. Improvisation isn’t just about being funny. It’s so much more than that: it strengthens our ability to make choices, to take risks, and to trust our gut because it increases confidence. These are the same qualities that have facilitated some bold and successful career moves in my life. No guts, no glory – of course, women don’t have to bet the farm to succeed. They just need to reach beyond where they “think” they are just capable enough. That’s what men do. Statistically, men fail more, and they also succeed more. That’s because they take “bigger” chances where the downside isn’t all that bad, and the upside is substantial. The bottom line is that “risk” matters, especially in careers and comedy. This lack of bigger “game” risk-taking has longer-term economic implications for women and explains, in part, the gender wage-gap that still exists today. According to an April 2010 report released by the Labor Department, that gap though narrowing, is 21% for equal work. Yes, women are more likely to take time out from the workforce to have and raise children than their male counterparts, and this accounts for some of the gap. However, research also tells us that women are also less likely to take risks in negotiating pay, better benefits, and promotions, and in taking “risky” projects that also come with high visibility in the organization. In the end, less risk-taking in a woman’s career leads to a lifetime wage gap estimated to be greater than $500,000. In his book Outliers, author Malcolm Gladwell explores at length the concept of 10,000 hours: it takes approximately 10,000 hours of practice and experience to reach virtuoso status in an area of expertise – music, software programming, painting, innovating, and comedy. Of course, part of those 10,000 hours will involve failing if you are doing it right. This short of it: you can’t achieve expert status without trying, failing, taking risks, and learning from those choices. There are also various degrees of risk and it’s important for women to recognize that many of these choices involve “recoverable” risk where no one is hurt, besides maybe a bruised ego here and there. Research also points out that men and women, on average, deal with and process failure in different ways. Men, for instance, on average look at failure not as a personal flaw, but rather, as a situation outside themselves that just didn’t work out. You win some, you lose some, you move on. Conversely, women are more likely (on average – yes there are individual differences) to personalize failure and view it through the lens of some shortcoming on their end. Whether it’s comedy or career, the same risk-taking is needed to grow to the next level. Just as men take bigger career risks, they also tend to take more chances in comedy. That begs the question – what can women be doing to strengthen their ability to take measured risks and to see failure as learning rather than personalizing it? Moreover, “failure” isn’t bad – it’s part of the growth process. You are expected and encouraged to fail or you’re not trying hard enough to grow! Yet, the good news is that much of this difference has to do with skills and behaviors that can be learned by women. One of the best ways to help people (regardless of gender) learn to trust their instincts, take small risks that lead successfully to bigger ones, and learn to see failure as learning is through improvisation. 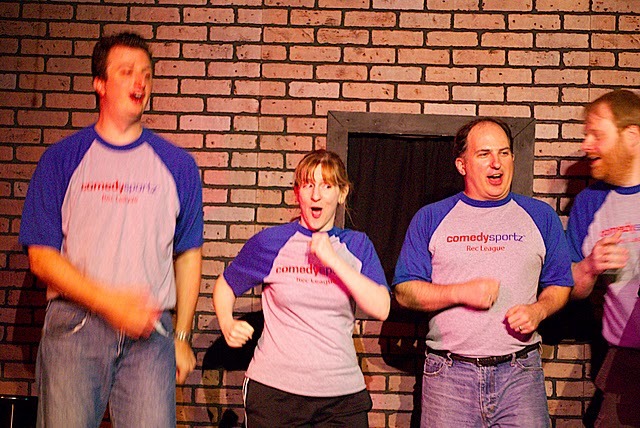 Improvisation is based on a positive framing – “Yes, and!” mentality that accepts offers from others, builds on other suggestions, allows people to stay focused on the present and to fail good-naturedly with small risks. Improvisation strengthens decision-making skills by making it OK to fail. You have to fail to know what works! Without the risk-taking, there is no success. Improvisation creates a safe environment where failure is encouraged because it means you are taking changes, pushing the envelope and exploring to see what works. Over time, your instincts are strengthened and risk-taking becomes less scary. There are no “wrong” answers in improvisation; there are many choices and alternatives. Improvisation strengthens our ability to react to the situation at hand – to respond with our own solid choices that accept and add (the “Yes, and!”) on to “offers” presented to us by others. Little risks (with low stakes) taken over time lead us to make bolder and bigger choices as we grow in our confidence. This permeates others aspects of our lives including our careers. While improvisation won’t change the overall national salary gap any time soon, it will strengthen women’s confidence in their own choices, in their risk-taking and will help them learn that “failure” is not personal. Nor is it something to be feared. It happens, you learn and grow from it, and you move on. And sometimes you get it just right, and get a “win.” Like when you negotiate for better pay. And it’s those little individual wins that, in aggregate, will lead to the narrowing of that pay gap over time. After all, ladies, we’ve got nothing to lose by trying. It’s the high cost of “failing” to take smart risks – the lack of pay equity and loss of “bigger” careers – that we should fear. Getting psyched (or psycho-ed!) for the match: Game On!